The UK's Leading Supplier of Personalised Gifts. Since 2008 our mission has been to provide personalised gifts of exceptional quality and create a refreshing customer experience. Our skilled and dedicated team are equipped with the latest engraving technology and are ready to bring your ideas to life! Our reputation to provide a quality customer experience is reflected by our online feedback and review scores. These can be found across multiple globally trusted independent review websites such as feefo and Google. We’re proud to have achieved 'Gold Status' for three consecutive years whereby companies must provide consistently outstanding service with over 98% positive feedback, within a 12 month period. Thanks to the range of delivery options we offer, we're confident you will find the one that meets your needs. We aim to despatch every order within 2 working days during busy holiday periods. For those of you who just can't wait to receive your gift, we offer a very next day delivery service to UK customers including Saturday delivery by Royal Mail. We also offer 99p delivery on all orders over £29. We specialise in glass engraving and have a wide selection of wine, whisky, personalised gin glasses and pint glasses, all of which can be engraved with text and or logo's. 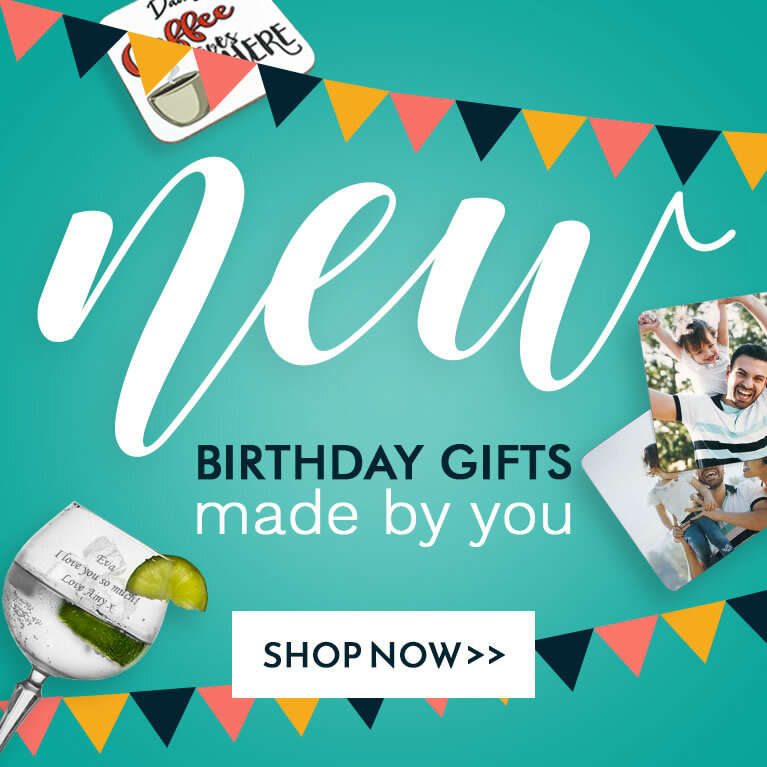 We offer a wide range of quality tested products suitable for birthdays, weddings, anniversaries and many more special occasions. We consistently carry out market research to source new product lines, examine industry trends and collect customer feedback for analysis. Our engraved glasses and personalised photo frames are particularly popular gifts for weddings. We sell money boxes for christenings and have a variety of unique gifts to suit your budget. We also offer personalised printed gifts on items such as glass tokens, wallets and vases. We offer a fantastic service for large orders and provide competitive discounts for large quantities. We ensure products are of the highest quality and delivered to you as quickly as possible. Fancy using your own logo for a corporate event or simply feel like treating yourself? We have you covered. Bespoke designs can be engraved on a variety of materials and products including glass, metal hip flasks and wooden photo frames. Brands we have collaborated with in past include McDonald's, The National Trust, The History Channel, The Bristol Red Cross, The RAF and much more. If you require a proof before you order or would like to enquire about a large order then please contact us and let us know of your requirements.